Laemmle Theatres which is pronounced as LEM-lee is a group of arthouse movie theatres run by Robert Laemmle and son Greg Laemmle. It had been in the year 1938 when Robert Laemmle's father Max alongwith his cousin Kurt had started their 1st movie theater in Highland Park. 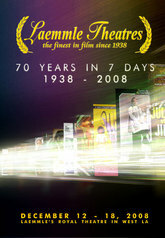 It has branches in 9 locations - Claremont 5 in Claremont, Music Hall 3 in Beverly Hills, Fallbrook 7 in West Hills, Playhouse 7 in Pasadena, Monica 4-plex in Santa Monica, Sunset 5 in West Hollywood, Royal Theatre in West Los Angeles, Town Center 5 in Encino, and NoHo 7 in North Hollywood. There are currently 0 consumer reviews about Laemmle Theatres available. Share your review. Please take a note that you are about to post a public review about Laemmle Theatres corporate office on CorporateOffice.com. This review will be public, so please do not post any of your personal information on this website. If you would like to contact the corporate offices of Laemmle Theatres, please use their contact information such as their phone number, website, and address listed above to contact them. However, sometimes staff from Laemmle Theatres headquarters do read the reviews on this website.